A new report looking at Affordable Handsets from Informa Telecoms & Media recently hit the shelf in the AfricanTelecomsNews.com library. The last major developing telecoms market is Africa, and one of the problems with that market us that it consists of some very low income groups. If there was every a long-game to be played, this is it. The International Telecommunications Union and the GSMA have variously shown that there is a direct correlation between mobile phone ownership and GDP. The more people who use mobile phones, the higher the GDP growth. It therefore follows that supplying devices to a classic low ARPU market now will help prime a future high ARPU market of the future. One of the problems for vendors in Africa is the illusory mobile penetration, as many of the existing phone users have multiple SIM-cards. At the end of 1Q13 'Africa & Middle East Telecom-Week' put the mobile subscriptions per head of population at 69 percent, with the suggestion that the mobile subscriber per head of population is closer to 45 percent. Ericsson in its 'Mobility Report' for the first quarter noted that the regional differences are large. It reckons that in 2018 almost all handsets in Western Europe and North America will be smartphones, compared to 40-50 percent of handset subscriptions in the Middle East and Africa and Asia Pacific regions. The report suggests that less mature regions are dominated by 2G technologies, like GSM/EDGE, while more mature regions like Western Europe are dominated by HSPA. LTE is growing very strongly, particularly in North America. In all regions, 2G networks (GSM/EDGE, CDMA 1X) remain as fallback networks for 3G and 4G subscriptions when coverage is missing. Ericsson notes that in 2012 the Middle East and Africa were dominated by GSM/EDGE, and that by 2018 it will have the largest share of GSM/EDGE, driven by demand for low-cost phones. The region is hugely diverse, so there are, and will be, large differences between developed and less developed areas. This suggests that there is still a huge potential market for affordable (or low-cost) phones, rather than smart phones. The 'Affordable Handsets: From Imitation to Innovation' study defines three strategies for affordable phones, namely Mobile phone centric; Integrated; and Computing centric. The study defines three approaches, with Mediatek leading the Mobile phone centric sector; Qualcomm heading up the Integrated approach whilst Intel and Nvidia are driving Computing centric designs. From an African perspective, Mediatek's mobile phone centric approach means that their phones can be targeted mainly at the low-cost segment with competitive pricing. Perhaps, crucially, there is a fast time to market which the study suggests could be 20 weeks or less. There is a downside, namely that there is late adoption of innovation, with design based on thin modems. Informa also notes that there's also a weak software-hardware integration with little flexibility for differentiation/local variations, and no 'go-to-market' support. The Integrated approach offers greater opportunity for up-scaling, and is being led by Qualcomm. The advantage is that there's something for all segments from high-performance to low-cost, and design is based on fully-integrated media/communications processing. There's also deep software hardware integration. This results in flexibility for differentiation/ local variations coupled with strong 'go-to-market' support. And for a market like Africa, there's the bonus of strong ties with the developer community, but the phones are ecosystem-centric. Finally, there is the Computing centric approach being progressed by Intel and Nvidia. They are currently targeting value high-performance segments, and there are longer time-to-market issues (typically 45 weeks plus). There's differentiation on performance, with early adoption of innovation, and design based primarily on media processing. On balance, the mobile phone centric approach is the right one now for Africa as a whole, although there are the well-known Asia smartphone heavyweights sizing up the high net-worth individuals located in markets such Nigeria and Kenya, where submarine cables are already glowing, and 3G and 4G networks are deployed or planned. There are some highly successful African mobile stories. MTN goes from strength-to-strength in many African nations, and even Econet, which has failed to find real traction outside Zimbabwe, has done very well in its domestic market. Vodafone's influence can been seen in Vodacom and Safaricom, but nonetheless, they are very much African operations. So what of Glomobile? In many ways it too is an African success story and has made some bold steps, such as providing its own submarine cable connecting West Africa to Europe (Glo 1). Yet somehow it doesn't quite seem able to power itself to a dominant position in any of the markets it currently operates in. In Nigeria, the market it first launched in, it has some 23.83 million subscribers at the end of March 2013, but was down from the 24.12 million it had at the end of 2012. 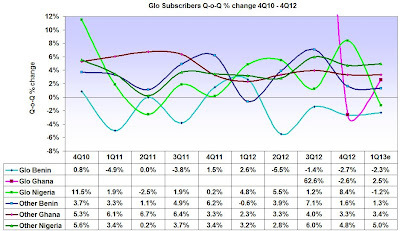 In terms of Quarter-on-Quarter % change, Glo has only 'beaten' a basket of its competitors in four out of the last 10 quarterly periods. Benin is another market where it should have a strong level of support, but again it has only beaten the basket of its competitors in 2 out of 10 quarters. In Ghana it seemed to have much in its favour when it launched last year, with a strong emphasis on data, and looking as if it would be able to leverage its Glo 1 submarine cable. Yet at the end of the March quarter it had rallied but was still not able to beat the competitor basket, despite being a new network and a low subscriber base (so better able to achieve greater growth with a lower number of net additions). Admittedly Glo competes directly with MTN in all three markets, and the latter has greater resources and experience to draw on. One suspects that Glo's senior echelons are very aware of this, and have been trying to close the experience gap. Investment is certainly an issue, and Glo belatedly announced in April this year that as part of its tenth anniversary celebration it was 'investing heavily' in network expansion and a technical network upgrade. The 12-month upgrade is to see the installation of new switches, increasing the number of mobile switching centres to ease congestion and construction of an additional 4,000 km of fibre optic cable which will complement the existing fibre optic facility - already claimed to be the most extensive fibre network in Nigeria. But Glo's other problem is finding the executive staff capable of driving its strategy in its three markets. Steve Bailey resigned his post as Chief Commercial Officer at Glo Nigeria only a month into the job. Bailey left Virgin South Africa at the end of May 2012 to take on the role of Chief Commercial Officer at Glo, and was reported as having returned to South Africa after just weeks in the job following delays and underpayments in salary. In Ghana Glo is targeting a problem with dealerships. Through to June, Glo is offering prizes 'running into millions of Ghana cedis' for its 'outstanding dealers'. Glo claimed the incentives were the 'best in the industry', but perhaps more tellingly in the same release Glo said it was in the process of upgrading the network by April 2013 to offer the most extensive 3G coverage in Ghana. So maybe this is the root of the Glo's problems: the product in its present form is simply not sufficiently compelling given the presence of some well-known and well-established majors. Still, Glo is not the only group to blame the retailers - on Sunday Virgin Mobile was claiming that it too had been driven out of retail outlets in South Africa by two large local operators. There could be a pattern here as it was MTN and Vodacom that are apparently been using their market collateral again to good effect. It's a tough job being a major group but someone's got to do it. Click here for further African telecoms news briefs week ending 12 July 2013. Virgin Mobile - and the Virgin Group as a whole - has always positioned itself as something of a people's champion, that knows a thing or two about promoting itself. Yet this weekend in the South African 'Sunday Times' newspaper Virgin Mobile South Africa CEO, Jonathan Marchbank blamed Vodacom and MTN for being too effective as major competitors. He described their recent actions as 'unregulated, anti-competitive behaviour', which was making it difficult for smaller players to enter the market. The nub of the problem is that retailers, according to Marchbank, will not give Virgin Mobile products the required space as they lose ‘trailing revenue’ from existing partnerships with Vodacom and MTN. This possibly takes too simplistic a view of how retailers operate, as they too have to maximise revenue. The issue might be that from launch Virgin failed to identify a Unique Selling Proposition, and it will continue to be a minor player until such time it finds a position or offering that the market wants. The correct answer is to show your research that proves there is a significant niche that is currently unserviced by any existing publication, and that you have a serious media campaign booked. Another rule is that any item stocked should have the expectation of making at least two sales per annum. This used to be true in record stores, and explains why when you asked for a record you think is well-respected, you are told 'There's no demand'. What the shopkeeper really means is there is insufficient demand, which isn't quiet the same thing. This is where Internet retailing has made a big difference, allowing products for which there is a national, aggregated demand for to be retailed through a specialist outlet. The problem for Virgin, with its reported half a million subscribers, is that it is meeting this low-volume, specialist criteria. South Africa has some 67.9 million mobile subscribers at the end of the first quarter 2013, which gives Virgin just 0.7 percent of the market. And its not as if the retailers haven't had sufficient time to get a feel for the Virgin offering, as Branson first jumped from an air balloon to promote the launch of Virgin and per-second billing back in 2006. In June 2006 Virgin Mobile formed an equal-stake joint partnership with Cell C, and Branson said it would leverage the Cell C network to offer low-cost and high quality services to its customers, and the two were to invest over ZAR 700 million (USD 95.66 million) in the venture. But there were already some indicators that Virgin - having brilliantly exploited the mobile youth market in the UK - could not always be expected to find a similar Branson-sized hole in other markets. It was just nine months after launch in July 2002 that Virgin Mobile pulled out of Singapore leaving network operator Singtel with a loss of about USD 25.6 million. At the time Ivan Tan, SingTel’s spokesman, said that the one-off charge allowed for the fact that not all of SingTel's initial USD 50 million investment had been spent. According to Tan, the charge was in addition to operational losses made by the venture in the previous financial year. At the time the two said in a joint statement: "Both the Virgin Group and its partner SingTel view the market [as] too saturated to sustain an otherwise successful virtual network operator model. 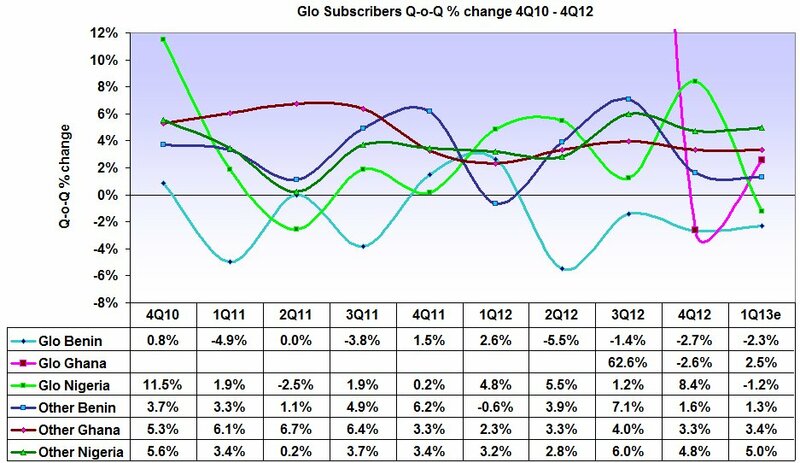 The subscriber net growth for mobile phone operators in the Singapore market has not been sufficient to sustain a new entrant in this mature market place." Virgin Mobile began its operations in Singapore in October 2001 and signed-up 30,000 customers by the time of its demise, compared to the 1.8 million it had in the UK, and 220,000 in Australia. This compared to SingTel with some 1.4 million subscribers, MobileOne Asia with about 900,000 and StarHub 350,000. A share for Virgin of 1.1 percent. Prior to the closure, SingTel Mobile’s CEO Lucas Chow in March 2002 claimed that Virgin had not communicating its value proposition to the market well enough. Chow was quoted as saying: "The Singapore market is actually a very sophisticated market and the users have a certain set of expectations and when you do not deliver that set of expectations, it is very difficult to actually get new subscribers". A bit like South Africa then. Chow noted that whilst Virgin Mobile's strategy was 'unique', the company might need to brush up on getting its message across to the market....and, of course, the retailers.... This is a sort of 'what came first, the chicken or the egg', only in this case, the 'what comes first' is the demand from the market, a lesson that Virgin apparently still has not learned.